Chelsea enter race for Pepe? 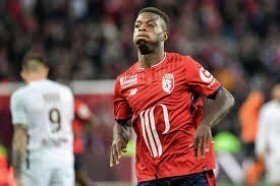 Chelsea are reportedly prepared to offer strong competition to Arsenal in the race to sign Nicolas Pepe from Lille at the end of the campaign. The 23-year-old has enjoyed a standout season with Lille in Ligue 1 and he has already notched a combined 30 goals and assists to date. This has attracted interest from the likes of Bayern Munich and Arsenal but according to Telefoot, The Blues have added him in their wishlist for the summer. Lille president has already confirmed that Pepe will be sold at the end of the season and a fee of around £68.8m is likely to be sufficient to lure him to the Premier League. Chelsea are expectant to lose the services of contract rebel Eden Hazard during the summer and Pepe has supposedly been earmarked as the ideal replacement, should they manage to overcome or freeze their current transfer ban. The Blues are currently outside of the top four positions in the Premier League on goal difference following Arsenal's 1-0 win over Watford on the road last night.